The state’s Budget size has increased to Rs 57,648 crore but at the same time its expenditure this fiscal is expected to shoot up. Punjab’s revenue receipts (earning) for 2012-13 will be Rs 38,043 crore, while its expenditure during the same period will be Rs 41,166 crore. The revenue deficit, therefore, has been pegged at Rs 3,123.31 crore, which is 1.14 per cent of Gross State Domestic Product and fiscal deficit at Rs 8,923.92 crore — 3.26 per cent of GSDP. The major thrust is on education, health, agriculture and social sectors. 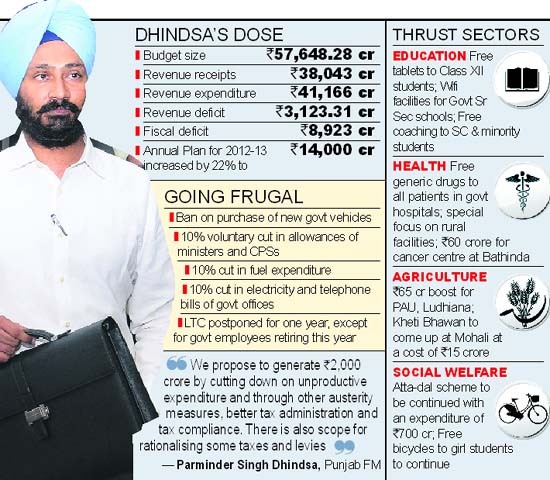 Terming it as a youth-oriented Budget, Dhindsa announced free tablets to 1.5 lakh Class XII students at the cost of Rs 110 crore to the state exchequer. The students of Class 11th would be covered next year. All government senior secondary schools would get WiFi facilities. Employability allowance of Rs 1,000 per month has been announced for jobless youth, besides 100 sportspersons will be granted scholarships in 13 disciplines. Dhindsa has fulfilled 13 promises made by the SAD-BJP alliance in the election manifesto. These include setting up of knowledge hubs at Mohali and Amritsar, IT city in Mohali, 4 memorials in memory of Guru Ravi Dass, Bhagwan Valmiki, Shaheed Udham Singh and one for Jang-e-Azadi at Kartarpur, all costing Rs 20 core. The budget has made provisions for clean water and sewerage treatment plants in 45 towns that are on the banks of Beas, Satluj and Ghaggar. Also based on the election manifesto, the Finance Minister announced his government’s commitment to continue with distribution of free bicycles to girl students, provide them with free education and introduce the ‘Bebe Nanki Ladli Beti’ scheme where the state will provide Rs 20,000 to parents at the time of the birth of a girl child. Dhindsa made it apparently clear that the state required additional resource mobilisation through better tax administration and rationalising of taxes and levies. He said no new taxes had been levied, but the ruling combine would soon meet to mutually find ways to mop up more resources, even if it was through imposition of taxes. He indicated that there may be imposition of house and property tax as this was a mandatory requirement to get Rs 500 crore from the Centre for Urban Development under the Jawaharlal Nehru Urban Renewal Mission (JNURM). Dhindsa said the state’s committed liability on salaries, pensions, interest payment (on loans) and power subsidy formed 89.09 percent of the revenue receipts. The debt on borrowing made by the state for fighting nation’s war on terror in the 1980s has raised the outstanding loan to Rs 78,236 crore which is 31.51 per cent of the GSDP. The budget has been more on expected lines as the SAD-BJP alliance did not get any time to iron out difference on the issue of imposing tax on urban voters on account of the just- concluded civic polls. Just as polls ended, Deputy Chief Minister and SAD president Sukhbir Singh Badal went abroad, leaving no time for discussion on contentious issues like hike in power, water rates, sewerage charges and house tax on urban property.